The brutal, drought-bringing heat that arises from the colossal, near-mythical Draigon, is a fell portent, heralding the doom of a bad woman. 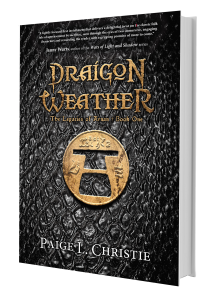 When Draigon Weather returns to the land, Cleod has the chance to fulfill all his promises—both to Leiel and to his new masters, the Ehlewer. But as the rivers choke on their own silt and heat cracks the earth, the choices the two friends made begin to catch up with them, for what plagues Arnan is more than just a monster. Buy Your Copy Now – Choose Your Favorite Online Bookstore Link Below! The land withers under the pall of Draigon Weather, ushering in a new Sacrifice in the trading town of Melbis. Cleod, lead sword of Kilras Dorn’s renowned caravan, finds himself haunted by his failures and the shadow of long-departed Leiel. Shaa, the Draigon that broke and nearly killed him, has returned, and the need for revenge ignites his soul. Now he must choose between two lives — that of solace and friendship or that of violence and death. Whether to be a trusted guardian or a Draigon slayer. Far to the north, the Draigon share old teachings, laughter, and heartache. Hard lessons prepare the newest of them for the role she will claim. Then, time-honored treaties between Draigon and Draighil are violated, threatening everything the Draigon protect. Now they must decide which is of greater need—continuing the secrets held for centuries or exposing the truth of their existence. For knowledge, the Draigon know and Cleod will come to understand, can raise a storm to shake the very future of Arnan. A tightly focused first installment that delivers a delightful twist on the classic folk tale of appeasement by sacrifice, seen through the eyes of two immersive, engaging characters and rewarding the reader with a gripping promise of more to come. 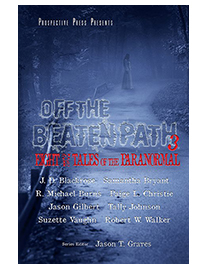 8 Ghost Stories by 8 Authors for Less That $8! The third book for the series is coming in the Fall of 2019. More details coming soon. The final book in the series is coming in the Fall of 2020. More details coming soon.